Discussion in 'Main Sports Forum' started by BMF, Feb 28, 2017. This is unbelievable. In 1988 there were less than 10 players in the NFL that weighed over 300lbs. Now, most NFL teams have their entire OL plus several DT's (around 10 or so 300 pounders). There's been players close to 400lbs at other schools, but most were fat asses/unathletic. This kid is a former Rugby player from Australia. 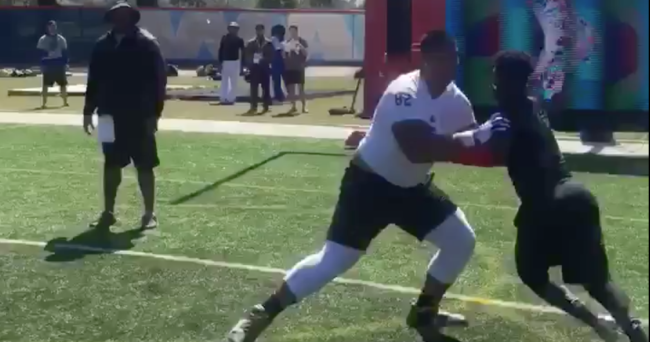 Faalele currently has 13 scholarship offers including Alabama, Arkansas, Georgia, LSU and Missouri. He does not yet have a 247Sports Composite rating, but 247 rates him a 3-star prospect and the No. 27 tackle in the 2018 class. ChiefGator A Chief and a Gator, Master of the Ignore list!!!! I do wonder why we don't have a better relationship in ING since it is in Florida and has talent from around the country. Plus that kid's about 200lbs. Let's not offer him until after he's committed to Bama. Looks like he was originally scouted by Jim Harbaugh. He went down and did a satellite camp in Melbourne Australia to check him out. They're familiar with our recent body of work? Combination of our recent run of suckiness, and there's always been an ex-FSU player or two on the coaching staff down there that steer the talent away from the good guys. Mac and staff need to get in there and get a player or two to break the ice. #27 at his position and a 3* where do we sign up, he fits the bill for Mac. Yes, he's a bit of a project. But, he's got the body and he's athletic. If he can learn his position (and also not to move his feet until the ball is snapped) he could pay off handsomely. I'm not worried. Our o-line coach we hired from the Mean Green has this on lock down. Rugby ? Turn him loose as a rumbling TE. Minnesota landed a big recruit, literally and figuratively, last December when the Gophers landed the signature of 4-star offensive tackle Daniel Faalele. The subject of a 2017 Sports Illustrated profile, Faalale grew up in Melbourne, Australia, but didn’t play or follow football (as most Australian kids don’t) until a Hawaii assistant saw him lifting weights as a (massive) 15-year-old. One thing led to another, and all of a sudden Faalele enrolled at IMG Academy in Bradenton, Fla. Surrounded by some of the very best football recruits in the country, Faalele’s size awed even his peers along the offensive line, but he had the skillset of a little leaguer. Faalele didn’t even suit up for games for his first year on campus as he acclimated to a foreign sport in a foreign country. He signed with Minnesota in December (the Gophers also landed two of IMG Academy teammates) and enrolled the following month, but Gophers coaches hoped to redshirt him as he fast-tracked his novice skills to handle the defensive ends of the Big Ten. Faalele appeared in Minnesota’s opening day win over New Mexico State, but, thanks to the new redshirt rule, that was only a quarter of his allotted appearances that wouldn’t count against his eligibility clock. Then the Minnesota game happened. In the midst of a 48-31 loss to Iowa on Saturday, starting right tackle Sam Schlueter surrendered three sacks in the first half, forcing coaches to insert Faalele for the second half. And with No. 3 Ohio State up next, Minnesota coaches have no choice but to burn Faalele’s redshirt in the interest of keeping true freshman quarterback Zack Annexstad (one of Faalele’s IMG teammates) in one piece. No, Mac was more like #200-300 at his position and recruited by South Alabama and Ga State. He's big but I'd have concerns about him being fast enough for our style of line play. I read somewhere he’s on two ships? I don't really see what the theory behind red-shirting him would've been anyway. Because with size and athleticism like that, if it all "clicks" for him at some point in terms of his OL skillset, then he isn't going to be a four-year player for them anyway. He'll be NFL-bound ASAP. On the other hand if he can't ever manage to master the game, then what did you gain with the redshirt? Might as well throw him into the fire and get what you can out of him, while you can.